Its name couldn’t be more accurate than this. 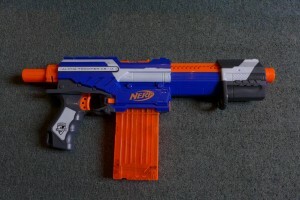 Fully automatic belt-fed Nerf blaster with 2 firing modes, battery-powered automatic and manual single-fire. Just flip the switch on auto and create havoc during any creative musical procedure. Use it without the belt holder for a John Rambo effect. 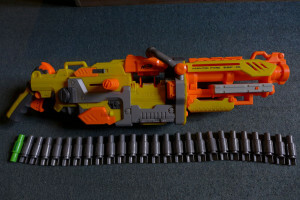 Comes with a tripod, Nerf belt, belt holder and 25 Whistlers. Standard issue infantry rifle. Magazine holds up to 12 Elite darts. Perfect for storming live rooms and control rooms. It’s capable of slam fire which provides the increased rate of fire one needs to prevail over his opponent(s). Unfortunately, the Alpha Trooper has a lock on the bolt sled which allows half priming and can cause jams. 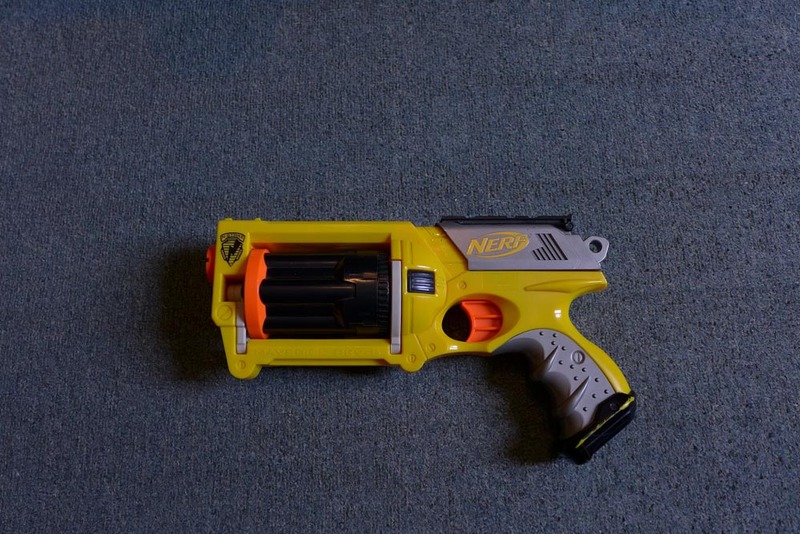 Revolver-type blaster, resembling the classic Mateba MTR-8, the Maverick REV 6 is capable of delivering pure fun. With an average rate of fire of 60 rounds per minute and a range of 7.5 meters it can break anyone’s balls despite the fact that it doesn’t hurt at all. 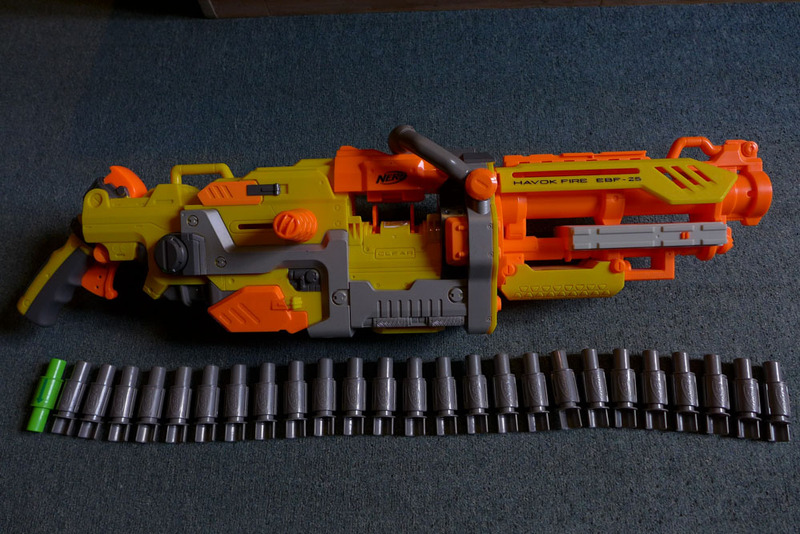 The tactical rail above the slide clock can fit accessories such as scope or tactical light. Also the darts make epic sound while in air(vziiiiiiiiiing…). We are currently training our dog Liaba to fetch the darts. I don’t think it will ever work…. The successor to the Barrel Break IX-2. It has the ability to fire two darts simultaneously with a full pull of the trigger. 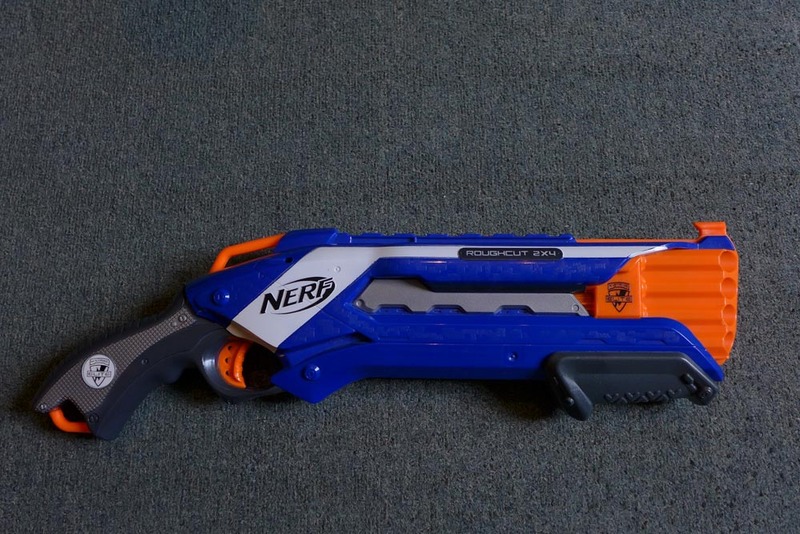 It also has the ability to send the darts from the garden to the roof making it the most powerful blaster in our arsenal so far. It totally breaks balls and an eye-shot is a TKO. Its slam fire, the jam-free firing mechanism and the combat shotgun resemblance make it ideal for zombie apocalypse scenarios. Click here to return to the instruments main list.